Firstly, a huge thank you to our members who make the club what it is. 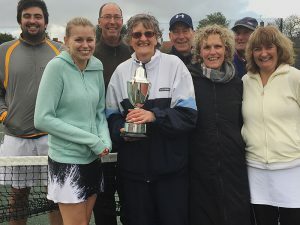 We had another really successful 2018 winning the Castle Acre league and in October, we lost the Terry Chivers’ Tournament in a nail-biting final set battle. A great day had by all, even if we didn’t come away with the cup! In addition to the tennis, we had a great social night at the Superbowl Escape Room in Feb this year, I think everyone escaped! And lastly, we had our Working Party in early April. I was well supported by members who gave the courts and clubhouse a spring clean ready for the year ahead. We hope to see you all in 2019 and happy to welcome new members. A big congratulations to our team of 8 who won this years Terry Chiver’s Tournament against, and hosted by, Burnham Market! The conditions were challenging (to say the least), with a mix of wind, cloud, rain and sun; but they persevered and were victorious! And all followed by a fantastic BBQ. WELL DONE and some more silver for the cabinet. The final results have now been released for all leagues and it’s good news for Fakenham. Due to the stellar efforts of all involved, we’ve retained our places in each league!!! WELL DONE EVERYONE!!!! For a full list the results take a look at the fixtures page. 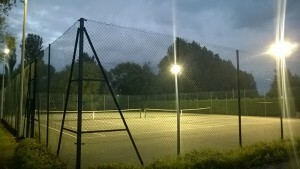 In the autumn of 2015, Ben, together with a friend, has been able to remove our old floodlighting & get some new L.E.D. lighting put up (despite it being an extremely hot day!!) & so winter evening tennis is much improved. With good facilities & a successful coaching program in place, the club is looking forward to a secure future. Last week saw our new flood lights installed which has already made a huge difference with the nights drawing in. The light is far whiter and less artificial which really makes picking the ball up a lot easier. As we become more and more reliant on the lights as the winter nights draw out we’ll really notice the difference. Many thanks to our resident electrician for installing them. You know who you are!!! This year brought us another great season. The mixed team in the Castle Acre league finished joint second. The ladies team were back in Division 2 and did really well to remain for next year finishing 5th despite many match rearrangements causing difficulty in arranging teams. The men are also maintaining their place in Division 5 although the exact position is not know yet. Again, a number of matches had to be rearranged which did make team selection difficult. Equal congratulations and thanks to all those that took part. The Club Tournament is quickly approaching so can you please let me know if you’d like to play by send me an email at thomas@wizards-online.com. It will take place on Sunday 12 April so can you please let me know by Sunday 5th April. If we have an odd number the final name will unfortunately be unable to play so please get your name in soon!!! I’ll also get a sheet in the club house for those not on email. The format will be mixed doubles playing a total of 8 games against each of the other pairs – 4 games with your partner, 4 after swapping partners. You keep track of the total number of games you win. For example if you win 3 with your partner and after swapping you score 1, your total for that game is 4, your partners total would be 6 as they scored 3 with you and 3 against you. In the past where there’s not been enough ladies we’ve made up the numbers with juniors – though if we’re still short it may be all names in the hat!!! The club web site has been given a facelift for the new year and is now hosted on WordPress. This new platform will make adding content to the site far easier and ensure that it’s kept up to date. If you have any ideas for info you would like to see on the site you can let us know via our Facebook page. Following the acquisition of the new clubhouse in 2006, the next phase of our improvements started. On a snowy Sunday morning in February, 2008, the members finished playing tennis early and swapped tennis rackets for hammers, chisels and other assorted weapons and demolished the two remaining walls that had surrounded the courts. These walls were approx. 3 feet high and within an hour they were down to court level. The following morning 4 of us helped the sports centre staff to load the bricks on to a digger, as the team from Doe sport began to remove the old netting, prior to cleaning and painting the posts and erecting new surround netting down to court level. In April Bryan, with help and encouragement from various committee members, took on the task of re-lining the court, with the newly acquired machine. A somewhat experimental task, very successfully completed and we entered the new league season with vastly improved facilities. The final, but most important, of our improvements was to get the courts resurfaced, and we are delighted to be able to report that on Sunday, March 18th 2012 club members got very wet, removing all the loose brickwork, ready for work to commence the next day – one week later, on the 26th, the bricklayers arrived & did all necessary repairs. On Thursday, March 29th a team arrived & did all the preparation work, & on Tuesday, April 3rd more men arrived to do the re-surfacing, only for the heavens to open & put a stop to everything for 36 hours. They finished on Thursday 5th,. however with Easter weekend starting the next day, another delay ensued before the lines could be painted. And, finally!! The club is now looking to improve the floodlighting & are hoping Ben will be able to get some new L.E.D. lighting put up in early 2015.